My wife liked these more than I did. If it were up to her, these would have gotten 8 or 9 stars. I didn't really think they were all that special, as far as granola bars go. But they weren't terrible, either. 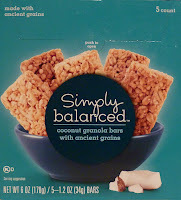 Flavor-wise, they tasted like plain granola bars with an essence of toasted coconut. I thought the coconut flavor could have been stronger, but Sonia liked it the way it was. She likened the flavor to macaroon cookies—not unlike the Coconut Macaroon Cereal we looked at last year. She's not wrong there, but I would argue that the cereal was just a little bolder in the taste department. As far as "Ancient Grains" go, you couldn't really taste them independently of the granola and coconut. I think marketers like to add the phrase "ancient grains" as a gimmick these days. But hey, it's worked on me before. And it'll probably work again in the future. I just hope those trace amounts of amaranth and quinoa are working their magic behind the scenes and making me super healthy when I eat them. Texture-wise, these granola bars are pretty much like any run-of-the-mill Quaker Chewy bar or a knockoff thereof. I feel like, if anything, these were a smidge firmer than traditional "Chewy" bars...but that could have just been my imagination. Plus, it's been a while since Sonia polished off the box, so I might not be remembering correctly. All in all, snackable and convenient, but not particularly memorable in my opinion. I might have gone lower score-wise, but the wife loved them so much, I'll go with something a tad higher in the end. If you're interested in looking at the ingredients, just click here. I give these Coconut Granola Bars 7 out of 10 stars.